Dubuque Iowa Photographer - We specialize in Wedding and Pet Photography in Iowa, Illinois and Wisconsin. 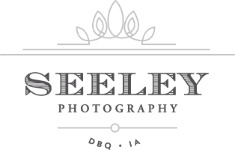 Seeley Photography is a wedding and portrait studio located in beautiful Dubuque, Iowa and available for weddings and portrait sessions in and around Dubuque, Cedar Rapids, Madison, Wisconsin, and Galena, Illinois as well as surrounding areas. We have been photographing weddings since 2006 and moved into our studio at 236 Main Street, Dubuque Iowa in 2012. We are available to photograph pets, newborn sessions, babies, children, family as well as weddings in Iowa, Wisconsin, Illinois and beyond.